Sometimes, you find yourself too lazy to cook and too concerned about your caloric intake to deal with delivery. On those days, having a stash of FreshDirect’s 4-Minute Meals in your fridge can make for a satisfying and healthy alternative. The ingredients come raw or slightly cooked in microwaveable containers with special valves in them, trapping in moisture so the microwave steams them to completion. The cook times are accurate, and impressively, the contents never end up rubbery. The level of flavouring is very good, on par with the similar meals you’d pick up at Marks & Spencer or Waitrose in the UK. FreshDirect’s got two main health-conscious categories, the “Smart & Simple” and the “Eating Well”. Both contain pre-made, microwavable meals under 500 calories from fresh ingredients. Smart & Simple focuses on nutrition and avoiding the use of hydrogenated oils, while Eating Well focuses on vegetarian-friendly fare. Having sampled nearly everything they have to offer in these categories over the last couple months, here are some thoughts and advice. Prices reflect FreshDirect’s December ’08 pricing. Lately, the quality control on this has been slipping, and the chicken meat has ended up with bits of skin still on, which seems unlikely to keep the calories in the advertised range, as it never used to have this issue. Still, a very flavorful dish due to the use of thigh meat and mushrooms, and the gnocchi hold up well to the microwaving. Strongly recommended. Nothing special here, and the hard brown rice kernels spawned a filling-replacing trip to the dentist. Avoid. Not enough food for the price. Avoid. Untested as yet due to the high price. Like most of the chicken with sauce and brown rice dishes, there’s nothing special here you couldn’t have just done yourself. Can’t recommend it. A reasonably sized piece of salmon, although it’s farmed and therefore not actually good for you. The asparagus and potatoes, though, end up perfectly cooked and complement the fish very well. Unfortunately, the price is not attractive compared to the other options. Mildly avoid. At only 330 calories, this is almost a snack rather than a meal, which is unfortunate, because it’s one of the best dishes they’ve got. If you hate raisins, this is one to avoid, but if you like a nice variety of textures and flavours in a meal that doesn’t need any added spice, this is a good choice. Strongly recommended. There’s nothing specifically wrong with this dish, but it’s uninspired. Can’t recommend it. A strong peanutty sauce and snap peas, along with starchy noodles, make this a reliable choice. It benefits from adding some extra garlic chili sauce to kick the flavors up a bit. Strongly recommended. A favorite. Filling, and with the addition of some smoky hot sauce (try Chipotle Tabasco), a very satisfying meal. The veggie chorizo mimics real crumbled chorizo well enough to keep this in most orders. Highly recommended. Even beets, basil, and balsamic can’t make seitan stop tasting like dirt. Strongly avoid. Solid flavor and a reasonable proportion of root vegetables to quinoa make this another favorite, as does the addition of two or three whole garlic cloves. Mmm mmm. Highly recommended. If you like mushrooms, this is a good option, although there’s not enough sauce and like many ravioli meals, the 4 or 5 pieces you get aren’t really enough to fill the belly. Recommended. Tastes fine, but has resulted in hours spent within line of sight of the toilet. Strongly avoid. The rapini is so bitter it overpowers the rest of this dish, which is otherwise bland, and more suited to being an appetizer than a meal. Avoid. Not remotely filling enough to justify itself, although the veggie meatballs are decent. Avoid. This guide for hosting out-of-town guests is part of the Williamsburger Hosting Guide. You can’t let friends visit Williamsburg without partaking in the staple of any good New Yorker’s diet: brunch. Most of the area’s many brunch venues stay open until 4, letting you and your guests sleep off last night’s hangover before filling your bellies with greasy goodness. 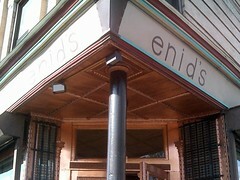 Although technically in Greenpoint, Enid’s is the gold standard for neighborhood brunch. It can fill up with a long line by 1pm, so an earlier brunch gives you a better chance of avoiding a long wait. I haven’t been able to go here in years without getting a Hungry Bear combo of egg, sausage, gravy, and biscuit with a side of grits, but it’s all good. Their pint-glass bloody marys are spicy, strong, and come with a nice big stalk of celery for munching on. Wombat’s duck hash (delivered with a friendly “and here’s your crack” by the owner) and a pulled pork sandwich keep this Australian eatery near the top of the Williamsburger brunch list. The burgers are amazing. 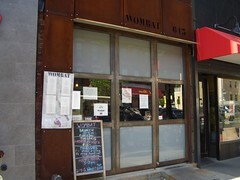 There’s also brunch here 7 days a week, so your NYC-savvy visit-on-weekdays guests don’t miss out. The combination of ham, gruyere, and a fried egg in Fada’s Croque Madame is one of the best brunch dishes in the neighborhood. Small tables make the meal into a comedy of geometry when brunch comes with coffee, water, and fresh-squeezed OJ, and that’s before you decide what everyone needs is a round of bloody marys. You need coffee and sweets for the energy to make it through a day of playing tour guide, and why show your guests anything but the best? Here are a few coffee joints and bakeries who stand out above the rest. 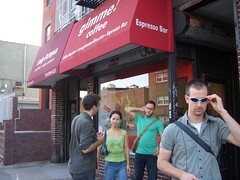 It’s hard to beat Gimme Coffee for excellent drip coffees and espresso drinks. Their beans, roasted in Ithaca, are a staple in my cabinet, and make an ideal New York souvenir for coffee addicts. The multi-thousand dollar Clover machine makes $3-4 cups of coffee that number among the best I’ve ever had. The staff is extraordinarily friendly and seems to truly enjoy explaining their new machine to gawking newbies. 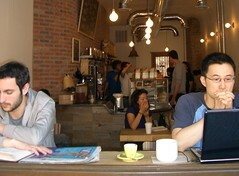 Go here for a cup of coffee that will surprise even the most experienced coffee fans. This old-school Italian bakery serves up cannoli and other pastries. 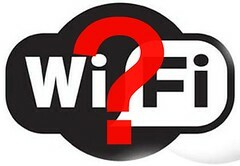 A great place to send your parents by themselves, as the staff is much friendlier to people over 40. It’s also one of the few places not populated by a homogenous crowd of 20-somethings. Sette Pani’s got fresh homemade chocolates and a wide variety of Italian desserts. Reliable and still inexpensive, I love their single-serving tiramisu cups and the pear tarts.